After scoring first and then falling behind, the LA Galaxy salvaged a late point against Toronto FC thanks to a stoppage time goal from Jose Villarreal. Mike Magee put the visitors ahead with his fifth goal of the season in the 16th minute, assisted well by Marcelo Sarvas. However, in the 29th minute, a poor back pass from Leonardo caused Carlo Cudicini to come off his line, and Robert Earnshaw was there to punish the mistake. Toronto’s second goal came in the 78th minute from Jonathan Osorio and it looked like the home side would get three points, but a scissor kick from Jose Villarreal in the last minutes of the game turned this one into a draw instead. Also notable in this match: Landon Donovan returned to MLS after his sabbatical, entering in the 60th minute for Jack McBean. Dallas continued their great start to the season on Saturday with an away win over the New England Revolution, though their lone goal took them until the 87th minute. Both sides enjoyed bouts of possession, but Dallas created the majority of the chances. They struggled to capitalize on those chances, however, until the 63rd minute, when Kenny Cooper thought he had given his team the lead. Unfortunately for Dallas, the goal was not awarded due to an incorrect offside call. Blas Pérez finally did give the visitors the lead with three minutes left to play, heading in a ball from David Ferreira. Four goals made this all-west match up a fun one, but the Rapids and Timbers ended up having to share the points. Dillon Powers started off the scoring in the 18th minute with a rocket of a goal from 20 yards out; it was his first MLS goal. The score remained 1-0 to the Rapids at halftime, and shortly into the second half, Tony Cascio drew a penalty that Hendry Thomas converted to make it 2-0 for Colorado. Portland, though, weren’t to stay down. Will Johnson headed home a cross from close range to get his team back into the game in the 55th minute, and about 15 minutes later, it was the Timbers’ turn for a PK. Will Johnson took the penalty and tied things up, and neither side could grab a winner in the last 20 minutes. The Quakes became the latest side to try and fail to break the Houston Dynamo’s unbeaten streak at BBVA Compass Stadium, falling 2-0 on Saturday. The Dynamo looked the better of the two teams from the start, and first-half goals from Will Bruin and Giles Barnes were plenty to seal the win. One positive for San Jose was the return from injury of Alan Gordon, but the Quakes attack was lacking nonetheless. Chris Wondolowski had a chance to cut Houston’s lead in half in the 68th minute, but somehow the ball skipped through his legs in front of goal. Otherwise, the visitors’ chances were few. Real Salt Lake turned in a dominant performance against the Seattle Sounders at Rio Tinto, leaving the visiting side with zero wins to start 2013. Robbie Findley gave RSL the lead within 10 minutes, but the striker had to exit the game not long after due to injury and was replaced by Joao Plata. Luis Gil’s diving header made it 2-0 for RSL on 35 minutes, and Seattle entered halftime down and without much to show for themselves. They improved in the second half, and in the 57th minute Brad Evans cut RSL’s lead with a left-footed shot that was only the Sounders’ second of the season. 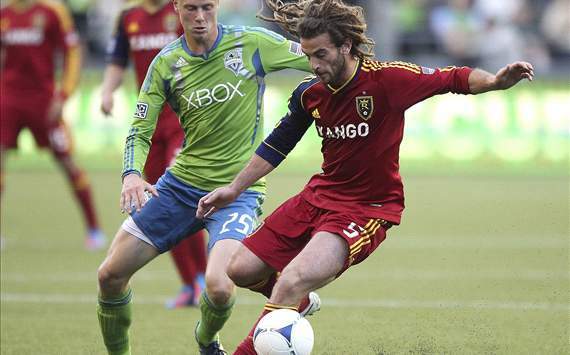 Seattle couldn’t muster an equalizer, though, and RSL grabbed all three points. Chivas USA capped off the month of March with a win over the Vancouver Whitecaps at the Home Depot Center, making their new coach look better and better. Carlos Álvarez’s cross in the 11th minute deflected off of defender Jun Marques Davidson and into the net, giving Chivas the lead. The Whitecaps applied plenty of pressure for the rest of the half, pushing hard for an equalizer, but Chivas held on. Juan Agudelo had to leave the game in the 34th minute due to injury, a real loss for the Goats, but his team still managed to get another goal. Eric Ávila scored a gorgeous volley in the 55th minute, effectively sealing the win. The ‘Caps did grab a goal in the 64th minute when Kenny Miller cleaned up Dan Kennedy’s save on an Erik Hurtado effort, but despite their work to salvage a point from the match, Chivas came away victorious. The Seattle Sounders and LA Galaxy both play CONCACAF Champions League semifinal fixtures this week, as they host Santos Laguna and Monterrey respectively. The Colorado Rapids and San Jose Earthquakes continue to deal with troublesome injury lists that have left them both lacking in the first month of the season, though Quakes coach Frank Yallop has said that Steven Lenhart will be on the gameday roster this coming weekend. That Landon Donovan guy is back. He almost scored right after entering the match against Toronto -- how long before he notches his first MLS goal of the season? Dallas are on the road next week as they travel to BMO Field to face Toronto. Colorado and RSL will duke out another Rocky Mountain Cup battle in Denver, while Portland host the Houston Dynamo and San Jose host the Vancouver Whitecaps. Will Johnson. 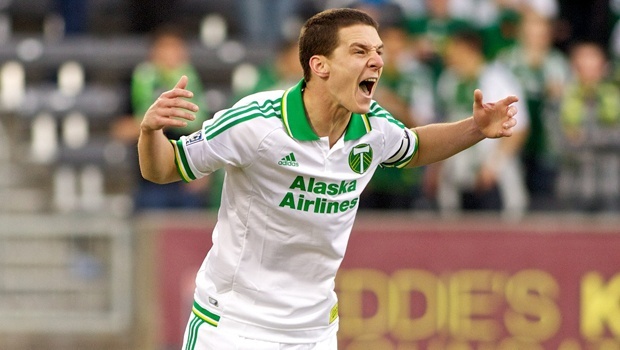 A brace for the Timbers man makes this a relatively easy choice; his goals meant that Portland came out of Colorado with one point instead of zero.